Spacers assist in installation of the piping system. We recommend that a spacer be used in each horizontal and vertical run of piping to adjust for dimensional piping differences. 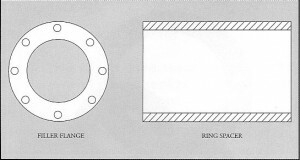 Spacers are available as filler flanges and ring spacers. Spacers can be machined in the field during system fit-up. This is important for existing piping systems where dimensions may have changed due to settling of foundations over the years. Filler flanges are full face with drilled bolt holes and spiral groove phonographic finish on both sides for a good gasket surface. They match the pipe inside diameter and flange outside diameter. They are available in sizes 3″ through 30″ and thickness as required for system. We maintain a stock of 1/2″, 1″, 2″ and 3 ½” thick filler flanges in the different pipe sizes. During field fit-up, tapered filler flanges can be used if mating flanges are not parallel. Ring spacers match the pipe inside diameter and fit inside the flange bolt circle. They are available in 3″ through 30″ sizes in specific thicknesses or in a standard 12″ length. The standard 12″ length can be cut to the required thickness and machined with a gasket surface.